The Marine Mammal Center (formerly known as The California Marine Mammal Center) was founded in 1975 by three local citizens: Lloyd Smalley, Pat Arrigoni and Paul Maxwell. Since then, and thanks to their vision, the Center has rescued and treated more than 20,000 marine mammals. 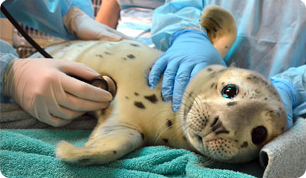 The Marine Mammal Center is the only organization authorized by the National Marine Mammal Fisheries Service to rescue and provide veterinary care for ill and injured marine mammals along 600 miles of California coast. We operate with approximately 45 staff and over 1000 volunteers who also work out of our additional field locations in Mendocino, Monterey, and San Luis Obispo Counties. Approximately 85% of our revenue derives from private sources; only a small portion of our funding derives from public sources, and the majority of the funds from public sources are designated for scientific research projects. On average, we rescue approximately 600-800 marine mammals a year, but the number of distressed animals has generally risen for the past 30 years. Nearly 50% of our patients are successfully rehabilitated for release to the wild. Animals undergoing rehabilitation in our veterinary hospital are also studied by our researchers, who publish their findings about marine mammal health and disease in peer-reviewed scientific journals. They also collected blood and tissue samples from the animals for the National Marine Mammal Tissue Bank. We publish approximately 10 research papers yearly about marine mammal health issues, and present our findings at scientific conferences. Our expertise with elephant seals and harbor seals is sought in providing animal husbandry solutions for the endangered Hawaiian monk seal, Mediterranean monk seal, and other threatened marine mammal species. Our core research includes studying domoic acid poisoning and bacterial infections such as leptospirosis in sea lions, cancer in adult sea lions that undergo post mortem, and health issues in harbor seals possibly related to contaminate exposure. Each year, our work is experienced and viewed by 100,000 visitors. Our education programs engage approximately 50,000 kids and adults, expanding awareness about our work and scientific achievements. Our school programs connect with the Next Generation Science Standards allowing for teachers to incorporate their visit into their lesson plans. Our Ocean Ambassadors program is a year-long program for middle schools that provides professional development to teachers, funded field trips and curriculum with resources and materials at no cost to schools. Funded through the generosity of our supporters, our Marine Science Scholarship Funds cover program fees and transportation costs that are a barrier to participation for some Bay Area schools. These scholarships serve schools based on the percentage of the students participating in the Federal School Lunch Program. Our Youth Crew provides students ages 15-18 the opportunity to become directly involved in the Center's work by volunteering on animal care crews or as education docents. To learn more about these and other education programs at The Marine Mammal Center, click here. There is always something going on at The Marine Mammal Center! Learn more about our upcoming events, including Marine Science Sunday. This free educational event takes place twice a month and is great for families!